I drove off the lands on Boxing Day 2015 and stayed a couple of nights with Bob Gosford. For my sins he forced me to answer his 10 question quiz. The original post is here. My pet hate listed in the quiz has certainly come to prominence following the 4 Corners investigation into the running of Indigenous Corporations. Please watch the show “Ripped Off” if you have not already seen it. In July 2015, Robbo was named the Pharmaceutical Society of Australia Pharmacist of the Year for 2015. Robbo has worked for the last ten years as a remote pharmacist in the vast Ngaanyatjarra Lands of Western Australia adjoining the NT and South Australian borders and is a tireless advocate for improvements in Aboriginal health. I had a yarn with my good mate Andrew “Robbo” Roberts aka @BiteTheDust over the Christmas break just before he flew out of the country for a few months. In July 2015, Robbo was named the Pharmaceutical Society of Australia’s Pharmacist of the Year for 2015. Robbo has worked for the last ten years as a remote pharmacist in the vast Ngaanyatjarra Lands of Western Australia adjoining the NT and South Australian borders and is a tireless advocate for improvements in Aboriginal health. The Northern Myth: Tell readers about yourself in ten words. Robbo: A ten word biography? 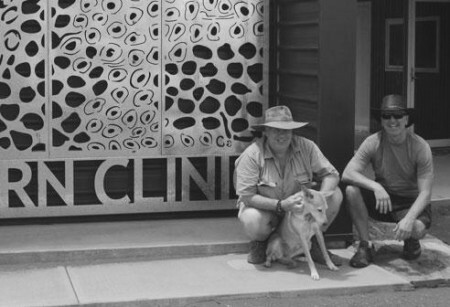 Desert, bush, medication, literacy, best-practice, education … Dingo, four-wheel drive. TNM: What makes you happy? R: Coming out of the bush and having someone make me a fresh coffee that I haven’t had to make myself. TNM: What makes you angry? R: The sheer waste you see and the blame-shifting by whitefellas buggering up indigenous organisations. TNM: Cats, dogs, both or neither? R: Dogs. The less said about cats the better. R: I don’t really listen to music much but out bush where I am you get the church going or some locals playing music somewhere in the community. There is always music in the bush. TNM: Your Desert Island disc? TNM: Where do we go when we are dead? TNM: What do you sing in the shower? R: Nothing. I’m not a singing person. TNM: When did you last break the law? R: Yesterday when I did a u-bolt outside your place without putting the indicators on (laughs) and usually every time I come into town because out bush you don’t worry about white lines or indicators. R: Top-loader – out bush that’s all there is! R: Pen! I love a fountain pen. I’m left-handed and I’m a shocking writer so at least it makes me try and have hand-writing that is legible. TNM: What are you reading in non-fiction? R: Not much at the moment, all my stuff is packed up. The last book I was caught reading was just released about the life and works of the artists from Wanarn Aged Care called The Wanarn Painters of Place and Time: Old Age Travels in the Tjukurrpa made with the assistance of the arts centre from Warakuna. Some great old artists from the lands have ended up at the aged care centre, including Dr. Mary McLean who is now a West Australian Living Treasure. She doesn’t paint anymore but she is a renowned artist who lived in Kalgoorlie for a number of years and moved back out to country to stop at the Wanarn Aged Care facility. R: Yeah, I’ve been churning through a lot of books. I didn’t read much for ages but I’ve been reading some nasty and forgettable crime fiction recently. Not much of any substance for a while.